Creamy comforting Hawaiian Style Potato Macaroni Salad, the perfect side dish to add a little aloha to your table! One thing I always look forward to when we vacation in Hawaii is the potato salad. Yes, I love the fresh fish and poke, the towering shave ice, and the fruit smoothies. Yet it’s the hearty comfort foods you find on a traditional Hawaiian plate lunch that really get me excited. I think it’s because some of these dishes are so unexpected in a tropical environment… Like Hawaiian Style Potato Macaroni Salad. At Hawaiian delis, you will find potato salad and you will find macaroni salad. Yet most commonly, you find a potato-macaroni combo salad with all the best attributes of both! With Hawaiian Style Potato Macaroni Salad you get the tender bits of potato, so soft they are breaking down into the dressing. Then you get firm, yet silky, macaroni pasta holding little pockets of dressing in each tube. 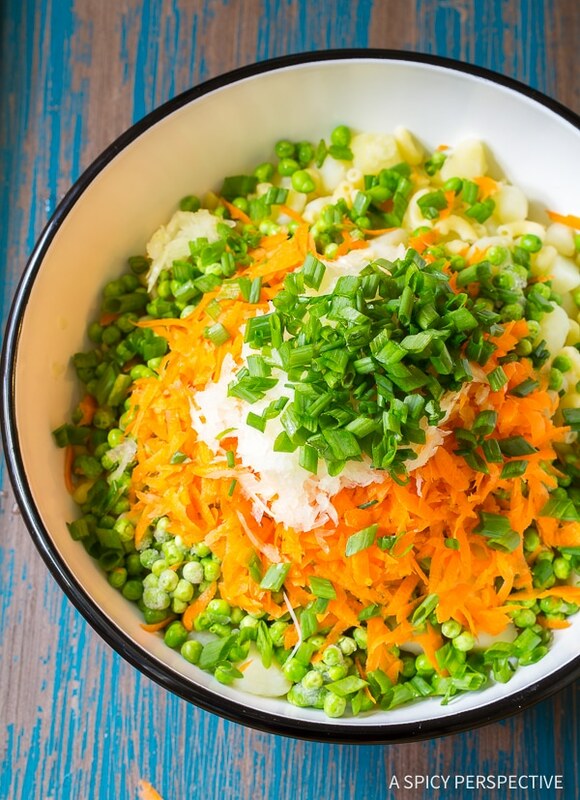 The surprise ingredients you don’t often find in either potato salad or pasta salad, is peas and carrots! 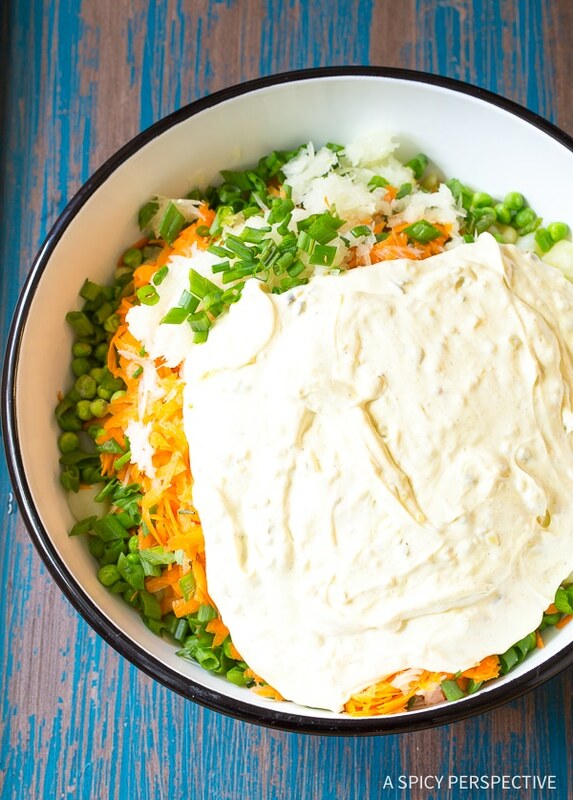 The sweetness of the peas and carrots, along with a touch of allspice, brings all the ingredients together into a salty-sweet side dish that makes you want to pull up a bowl and face-plant. Making Hawaiian Style Potato Macaroni Salad is no more difficult than making regular potato salad. Just remember to boil the potatoes for 5 minutes, then stir in the macaroni noodles, so the potatoes and macaroni finish cooking at the same time. Then toss in shredded onions, carrots, sweet peas, scallions, and a quick homemade dressing. 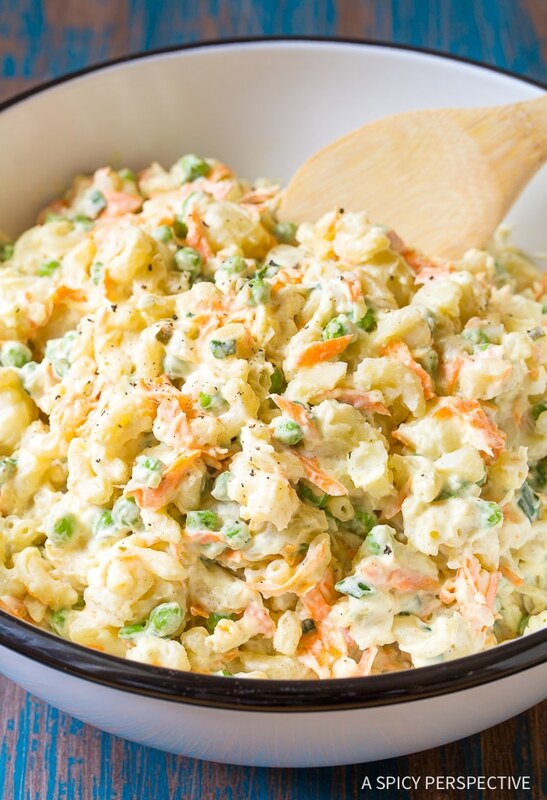 If you love making potato salad or macaroni salad for spring picnics and backyard parties, give this Hawaiian Style Potato Macaroni Salad a try. It has all the appeal of classic southern sides, with a touch of Hawaiian charm! Hawaiian Style Potato Macaroni Salad - A Hawaiian plate lunch special! 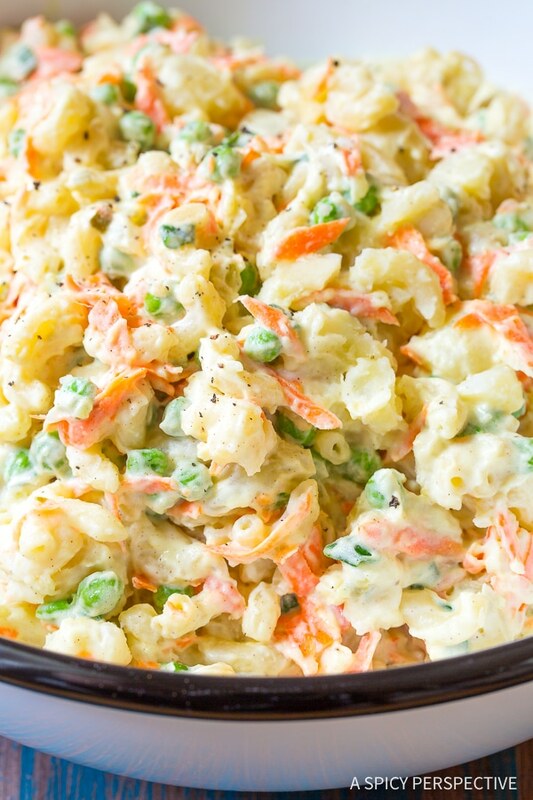 Creamy macaroni salad with tender chunks of potato, sweet peas, and carrots mixed in. Cut the potatoes into 1-inch cubes and place them in a large stock pot. Fill the pot with cold water until it is one inch over the top of the potatoes. Set the pot over high heat and bring to a boil. 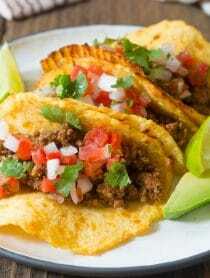 Once boiling, add 1 tablespoon salt. Then set the timer and cook the potatoes for 5 minutes. After 5 minutes, stir in the macaroni noodles and continue boiling for 6-8 minutes, until the pasta is al dente. Meanwhile, in a medium bowl mix the mayonnaise, sweet pickle relish including juices, apple cider vinegar, mustard, allspice, 1/2 teaspoon salt, and pepper to taste. Stir until smooth. Then use a grater to shred the onions and carrot. Drain the potatoes and macaroni in a colander and place in a large salad bowl. Add in the onion, carrots, peas, and scallions. Pour the dressing over the top and mix until well combined. Cover the potato macaroni salad and refrigerate for at least 4 hours. If you have time to make it ahead, it tastes even better on day two! Keep refrigerated in an airtight container for up to one week. NOTES: This salad is sometimes made with unpeeled new potatoes for a slightly different texture. Follow the instruction as is, yet leave the potato skins on when you chop them. This recipe has intrigued me. Can’t wait to make it this weekend, however I am concerned about the allspice. Why allspice and can you really taste it in the finished product ? This makes a lot and I would hate to have to throw it in the garbage. Allspice adds just a touch of exotic flavor. If you are nervous about it, you could add half, then add more later if you think it needs more. Love the flavor in this potato macaroni salad! Yum! 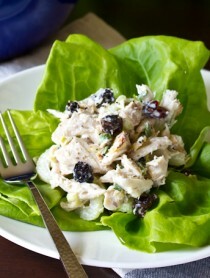 What a fun new take on potato salad! Can’t wait to give it a try!! Seriously a good one to share at barbecues! I’m so excited to try this! We have a Hawaiian resturant that we order take out from and I always ask for 2 scoops of this with my plate lunch because it’s so good. Love this twist on a classic macaroni salad! This pasta salad is delicious! You can’t beat the combo of potatoes and pasta! 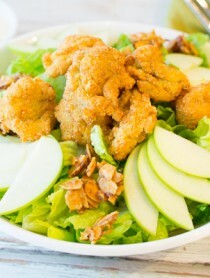 As a Hawaiian raised on this combination salad, standard with every lunch wagon bento, to a higher level! Mahalo for your recipes – You inspire me to continue tweaking recipes I love along with those I put together for my own pleasure and feeding friends. Sure glad I found your site. Is there any way to do the Hawaiian Potato Macaroni Salad in the microwave or slow cooker? If so, would you please share?